Gordon MP Colin Clark attended the launch of the National Decommissioning Centre (NDC) in Newburgh on Friday, January 11. Mr Clark joined UK and Scottish government ministers for the opening of the new research and development (R&D) hub in the north-east’s Energetica Corridor. 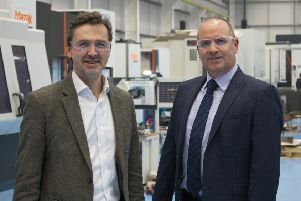 The Centre was opened by UK Government Minister Lord Duncan and Paul Wheelhouse MSP, Scottish Government Energy Minister. The government ministers joined industry and civic leaders to celebrate the launch of this long-term partnership between the Oil & Gas Technology Centre and the University of Aberdeen. The NDC is part of the Aberdeen City Region Deal, from which it has received £180million in funding. The establishment of the NDC is part of the Aberdeen City Region Deal, a joint UK and Scottish government investment in the north-east. Mr Clark said: “I was delighted to be present at the National Decommissioning Centre launch. “The research and development project is a collaboration between the Oil & Gas Technology Centre and Aberdeen University, and will help the oil and gas industry deliver cost reduction targets. “The centre boasts state of the art engineering facilities and will link up with other universities, institutions and innovation centres around the UK. Ellon & District councillor Gillian Owen was also at the opening event. She commented:“This centre is quite remarkable and after the launch we were given a tour so we could all see the innovative projects being undertaken. “Locally we a very lucky to have such a brilliant facility close at hand.